I wake up to the silhouettes of mountains outlined by the rising sun. I fumble through my pack and find my alarm clock – it is an automatic habit – and look at the time. 6:50am. I always wake up 10 minutes earlier than my alarm, but this time I am grateful for my neurotic habit. The air that surrounds me is cool and quiet, the only sound the distant crowing of a morning rooster. Saif is an entrepreneur supported by the Khalifa Fund, the UAE’s government fund that helps to develop small- to medium-sized investments in the country. Saif used the money to build a traditional Emirati campsite among the mountains of Fujairah, offering a unique cultural experience that takes pride in its rugged hospitality. Stripped of the glamor associated with its neighbors in Dubai and Abu Dhabi, the campsite has far-reaching appeal: Saif has had guests ranging from intrepid backpackers to dignitaries from the French embassy. For entrepreneurs like Saif, the future is bright with promise. Standing up slowly, every inch of my body tingles with awakening. 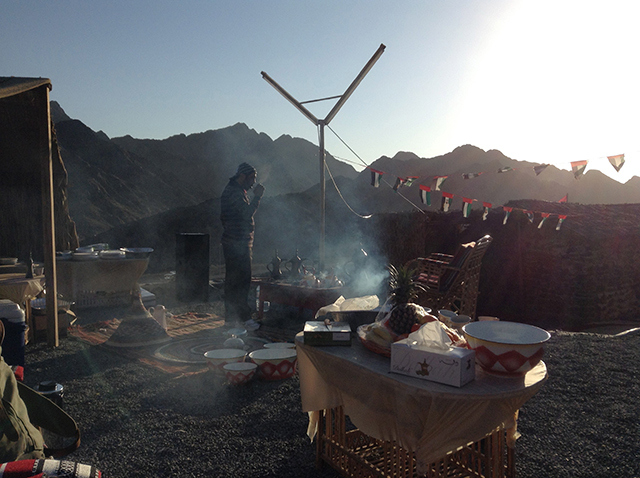 The front side of the tent is open to the panoramic view of Fujairah. For those who slept outdoors like myself, Seif has prepared tents adorned with Emirati fabrics, ornately patterned and resistant against the blowing wind. Others slept in stone huts topped with large swaths of thin leaves. I pause for a moment and look up from my notebook, and see that the sun has risen above the mountains. I let the warmth wash over me, and offer a small morning prayer in homage to the natural beauty around me. The mountain vistas of Fujairah rejuvenate me: I will return to the concrete cityscape of Abu Dhabi invigorated and refreshed. I have been looking into taking a short camping trip in Fujairah and while doing research I came across your blog post. I am very interested in the experience you had but am unable to find more information… I checked your link to Mr.Saif Al Dahmani but the website does not work. I have found other blogs on the subject but no usable info..
How did you find out about this campsite? Where can I book a space? How?? Thank you so much for your help on this, I really want to go! just like the poster above I would love to know where this campsite is. Ive read about Mr Saif Al Dahmani and his projects so would really appreciat eany information you could give me. Sorry for the late reply, I didn’t check back on my article until I happened upon it again today. I would love to connect you with Saif if you are still interested. Send me an email and I’ll put you in touch.